Gift a luxury stay at Larmont Sydney by Lancemore. Situated in the bustling Potts Point, be amongst Sydney's hottest bars, restaurant and shoppinb boutiques. 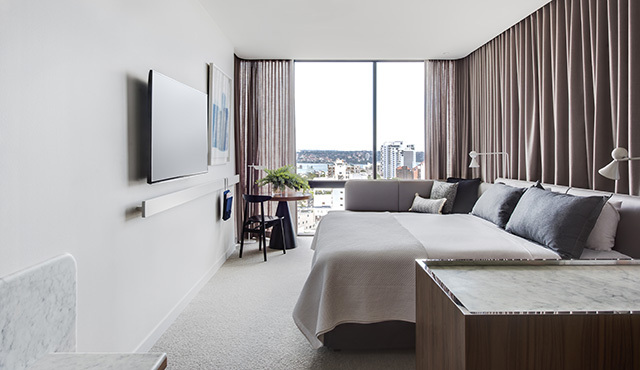 The stylish, Hassell Studio designed rooms are complete with heavenly cloud top beds, 55-inch Samsung Smart TVs, Apple TV, Bose Sound Touch, rain showers and delicious amenities by Malin + Goetz, Appelles Black or Molton Brown. Gift packages are valid for 12 months from the date of purchase. The recipient may redeem the voucher subject to availability of the selected room type. Black out dates apply. Please call Larmont Sydney on (02) 9295 8888 and quote your voucher number to book your stay. *Please note that this package does not include breakfast.